I made this dinosaur birthday cake for my son’s 5th birthday. I baked the volcano in a batter bowl (large Pyrex glass, measuring bowl would be the same). I found dinosaur cookie cutters and made royal icing to decorate them. For the ‘fire’ on the volcano I made my usual buttercream and melted it just a bit to make it pourable and then poured each color and let dry slightly before pouring the next. The palm trees are hard breadsticks with gummy candy for the leaves. Believe it or not, I was able to secure them to the breadsticks with a toothpick! It was my son’s 5th Birthday. He loves Dinosaurs so we decided on a Dinosaur theme. Last year for his 4th I had already made a fearsome Dinosaur birthday cake and I didn’t want to do the same this year so I was a bit stumped! 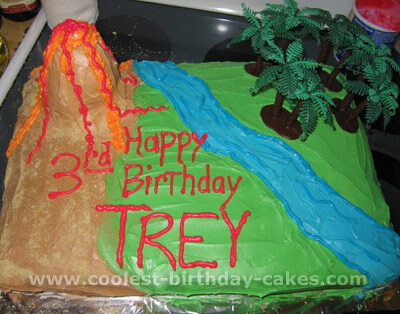 It was my son who came up with the idea of a Volcano. At first I tried to change his mind because I had no idea how to go about making a Volcano. I kind of imagined how I wanted it to look but I’m not very good without a picture to go by. Thanks to the internet and this site I had something to look at. I hired a ‘Dolly Varden’ tin from a local cake decorating supply shop (a Conical/triangular 3D cake tin). I used two 340g packet chocolate cake mixes for this tin. I actually made a mistake the first time and used 3 packets and filled it nearly to the top of the tin. I baked it in a moderate oven but it started to spill over the edge into my oven. It cooked well on the outside but was still not cooked on the inside properly after over an hour. I tend to get a bit uptight when I encounter problems and my husband came home form work and nearly turned around and went back again when he saw the cake oozing all over the oven!!! I took a deep breath and decided to try again with less mixture and I reduced the heat of the oven. It worked perfectly. You must also remember to grease the tin very well so there are no problems getting the cooked cake out of the tin. I then used my own chocolate cake recipe to make a 22 cm – 5cm deep ring tin. Once the cakes were both cooked and cooled I placed the conical cake on top of the upside down ring tin cake. I then cut out a crater from the top to give it a realistic look. It was starting to take shape. I love the icing bit – that’s the fun part! I used chocolate icing (icing sugar mixture small amount of butter cocoa and a milk to combine). Its the easiest icing to make and very easy to spread. I iced the whole cake and then added chocolate sprinkles to add texture. 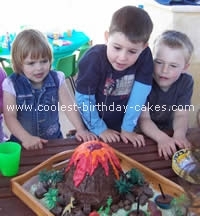 To make the lava of the dinosaur birthday cake, I used bright red and orange paste colouring (from a cake decorating store – the colours come out very well) and added it to more icing mixture. I used red first but made the consistency a little runnier to allow it dribble down. I let the chocolate icing dry completely before adding the red. After letting the red dry I added the orange using a spoon to dribble the icing down. Meanwhile my husband had been melting some red licorice in a small saucepan over another pan of boiling water (the same way you would melt chocolate), which we used on top in the crater. I had placed the dinosaur birthday cake on a large wooden tray with handles (I always find it tricky on traditional cake boards – the tray is easy to carry – especially when there are excited children around!). I coloured desiccated coconut green and sprinkled it over the tray to cover the base. To give the Volcano a realistic feel I used chunks of ‘Violet Crumble’ (chocolate covered honeycomb) and ‘Chochettes’ (peanut/caramel clusters covered in chocolate) to place around the base of the Volcano to resemble rocks and boulders. I then added some plastic palm trees and of course little plastic dinosaurs. I had a little cake mixture left over from the cakes from which I used to make 5 cupcakes. I put a candle in one. Finally I placed two sparklers in the crater of the Volcano and lit them just before singing Happy Birthday. My son absolutely loved it. I was really happy with the way it turned out, and it was easier than I thought. I did have lots of help from my husband (who later at the party dressed up as a dinosaur and chased the children all over the park). 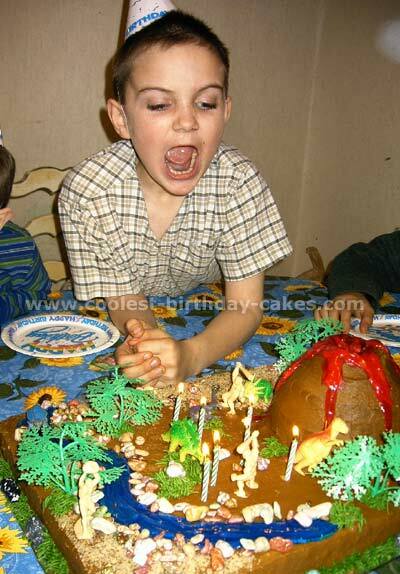 I hope you get some ideas from this dinosaur birthday cake – and good luck! This was a real simple dinosaur birthday cake for my son’s 2nd birthday. It is a large square cake iced in a light brown icing. I used a large tip and put the river down the middle and down one side like a waterfall. I then added a little grass with a cake tip. The volcano is a candy volcano (Amazon) it has its own lava. This dinosaur birthday cake turned out cute and tasted even better. Imitating everything his older brother does, my to-be-two-year-old is really into dinosaurs. After looking at lots of cakes here, I decided against the dinosaur shaped cake or to go for the landscape dinosaur birthday cake approach. The sheet cake is made in an 11×15 pan, with almost 3 boxes of cake mix. A little was used for one small mixing bowl and one cupcake. The sheet cake was frosted with chocolate frosting. The cupcake went upside down onto the upside down bowl, after which I cut away some of the bowl cake for a more concave shape. I put everything together with chocolate frosting. I crumbled a chocolate graham cracker over the volcano for debris. Then I mixed up a batch of white buttercream frosting (Wilton recipe) and divided it into 4: orange, red, blue, and green. I microwaved the orange and the red for 15 seconds after which it was melted enough to form nice dripping lava flows: orange first, then red, and a little more (almost hard again) orange chunks on top. 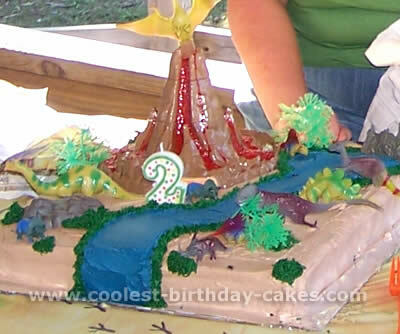 For the river I started with building the waterfall from the bottom up, then backwards over the top of the dinosaur birthday cake. Next came the plastic trees, boulders and dinosaurs. The nest was made with a few sour eggs and some chocolate frosting. Last came the vegetation in green, and the big 2 of course! Thanks for all the tips on this website, they helped a lot! I used a cake mix. Then used different colors of paste food coloring (hence the grey/black volcano). The volcano is made with 2 cupcakes, trimmed. Jujubes for trees, and crushed choco chips for rocks. I also used coconut that I colored with food coloring for a nest and Cadbury’s choco eggs for Dino eggs. And of course a couple of plastic dinosaurs. This dinosaur birthday cake was made by my cousin and I for another one of our cousins (we thought we would surprise him with a birthday cake of his favorite thing— dinosaurs). It’s a simple chocolate cake and the volcano is an upside down ice cream cone that we cut the bottom out of. For a pretty cool effect we put sparkler sticks in the middle of the volcano ice cream cone to make it look like it was erupting. The kids all loved it!! Caution: do not put the sparklers to far in the cone; the cone could catch on fire like it did at my cousin’s birthday party (although it was pretty funny…). My son is crazy about dinosaurs right now, so for his 3rd birthday that’s what we chose as the theme. I decided that I really didn’t like any of the cakes from the store for that theme, so I set out to make his dinosaur birthday cake myself this year. I started out by getting the biggest cake pan I could find. I believe it ended up being around 19×13. I just used regular cake mixes that were on sale at the store, it took 3 mixes for the big pan and 1 mix for the 3 small rounds that I was using to build the volcano. Once the cakes had cooked and cooled overnight (I wasn’t taking any chances) I started to build it. I used Pillsbury icing from the store, I think it was about 5 canisters total for the whole thing. I did a bottom layer all over of just plain white icing. That way the colors would go on a lot easier rather then just straight on the dinosaur birthday cake. 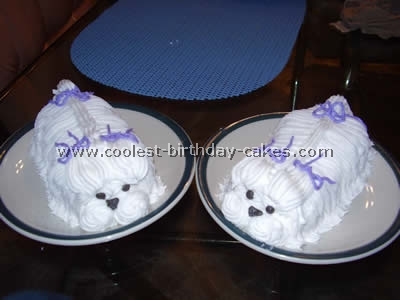 Once that was done, I put the 3 rounds together like a normal layer cake, with icing in between each layer. Once those were secure, I used a sharp knife to carve out a rough volcano shape (smaller at the top, bigger on the bottom). 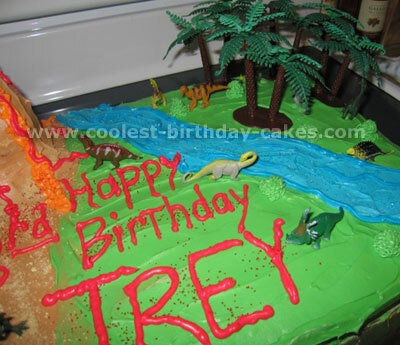 I then placed it on the dinosaur birthday cake and started mixing my colors. I had bought all white icing so that I could mix my own colors to get the exact shade I wanted. I did the brown first since it would also be the volcano color. Adding the icing to it also let me shape it a little better. 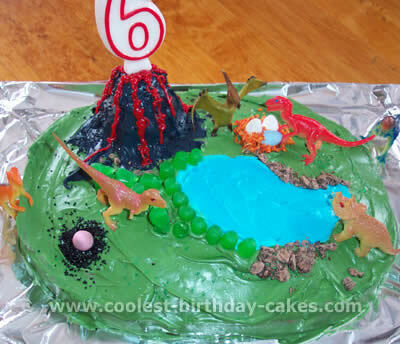 After that I just added the other aspects of the dinosaur volcano cake, the green grass, the blue river (which I also used a icing bag with decorators tips to add details to). I sprinkled crushed graham crackers on the brown area for dirt, and then got the fun part of adding the lava to the volcano! 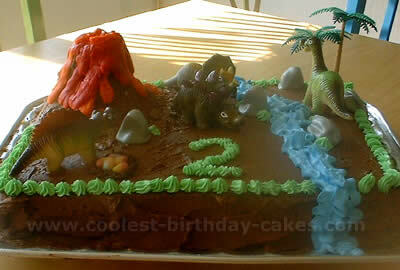 I used the lava to also write the birthday message on the dinosaur volcano cake, kind of like it was flowing into it. I then added the plastic pieces, the rocks, trees and dinosaurs, finished off with some green bushes for them to munch on and I was done! I used a wet cloth to wipe up my mess all the way around and boxed it up for the party the next day. Once it was time for cake, we took 3 red cake candles and stuck them in the top of the volcano almost all the way down, so it looked like it was erupting! Everyone loved our dinosaur birthday cake and there wasn’t a single piece left afterward! Even the volcano was eaten! I had a lot of fun making it and look forward to trying to come up with something fun for next year as well! To make this dinosaur birthday cake I started with a 11 X 17 cake and frosted it in brown buttercream frosting. I made the volcano out of a chocolate cake in a Pyrex bowl and placed that on top of the sheet cake and also frosted that with brown buttercream. For the lava, I used piping gel that I colored red, over red buttercream frosting. I made a small river winding down one side of the volcano cake with blue piping gel. I used finely ground nuts for my "sand" and candy rocks for rocks. I used a small plastic set of cavemen and dinosaurs with plastic trees. My son wanted some action on the dinosaur birthday cake so I cut off the feet of one of the cavemen and used red piping gel as blood in a few different places. The bottom border of the cake was done in buttercream strings to look like grass. This dinosaur birthday cake was so much fun to make, everyone loved it. Here’s our latest dinosaur birthday cake. It was done for a superhero party. I baked four 9X13 cakes, two cakes in Pyrex dishes and some little muffins. I put the four sheet cakes together and built my volcano on top of the sheet cakes. I built the volcano from the Pyrex dish cakes and cut them to shape. 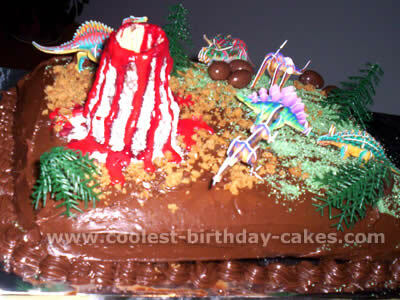 If I do a volcano cake again I’ll try to find a wider base to make it more volcano-shaped. I also built a "rock world" next to the volcano. To frost the volcano cake I first made the stream out of frosting colored blue. Then I added highlights of darker blue and white to make it look real. Then my son told me I had to have a beach. So, I made the beach area from brown sugar. I usually mix the brown sugar with the white sugar until I get the exact color of sand. After the beach I made the volcano. 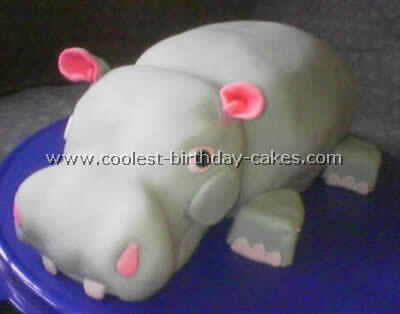 I first made it look like rock by mixing white frosting with some of the black store-bought frosting to get grey. Then I added ground-up Oreo cookies to make it look like rock and not just frosting. I frosted the mountain and the rock world with this frosting. Then I made red frosting and put it in the microwave so that I could pour it. I poured it down the sides of the mountain to make it look like flowing lava. 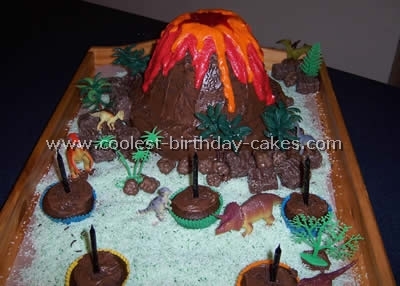 I then added highlights with yellow and red frosting to make it more realistic (I looked at volcano pictures on the internet to get color ideas). 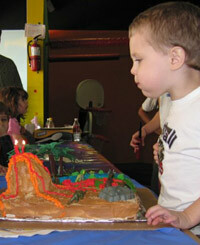 The exploding lava was made from homemade candy; the directions are on the family fun website. To make the rocks at "rock world" I used the cupcakes that I baked in mini muffin pans. I made different shades of grey frosting and frosted them and then laid them on the cake. I did this to make the rocks on the other parts of the cake too. The grass I did last on all the blank spots. I used coconut that I dyed green with food coloring. I added a little red to the green to make it a little darker in order to make it look more like real grass. Finally, we added the dinosaur and the super heroes. The picture does not quite show Spiderman climbing up the other side of the volcano and another dinosaur hiding around the opposite side of the volcano. My son was very excited when he saw the final product. It was neat because part of the landscape (the beach and "rock world") was his idea. 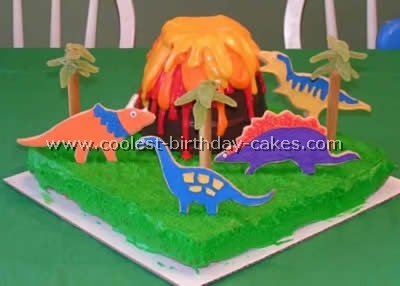 I got the dinosaur birthday cake idea from this website! I had to scale it down much smaller. I used a 9×13 pan for the base and 2 cupcakes for the volcano. After icing the volcano cake with the chocolate icing, refrigerate it, so red icing will just run over it smoothly. I put red icing in bag without a tip and just let it run out, since icing at room temperature is so runny. I used a flame candle and sparkle candles to make it look like the volcano cake was exploding. For this dinosaur birthday cake I used a sheet cake pan for the bottom. I used the Wilton Wonder Mold pan for the volcano and cut out cake boards in the shape of palm trees for those and placed pieces of cake on them (I cut the pieces to fit the board). 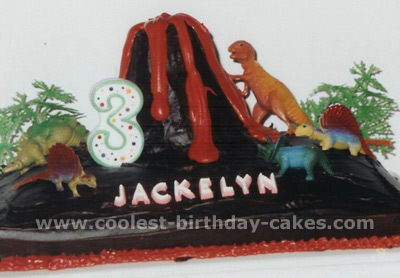 The lava for the dinosaur birthday cake was made by melting hard candy and laying it out on aluminum foil sprayed with non-stick cooking spray and allowing it to cool. 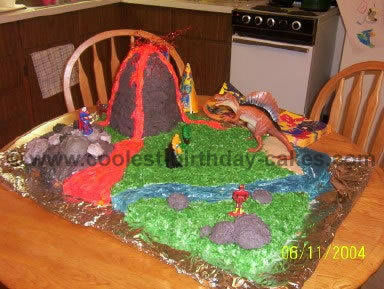 I took some long strips of aluminum foil and curved them a little to use as forms for the lava shooting out of the cake. I tinted some piping gel red and filled in around the ‘spikes’ of lava on the top, but the rest was all candy. I used plain white icing on the sheet cake first and then used chocolate icing on the volcano and sprinkled chocolate sandwich cookie crumbs (crushed fine in the food processor) over the volcano and around the bottom and did the same with vanilla sandwich cookies for the beach. The water is piping gel tinted blue with some Finding Nemo fruit snacks for the sharks and fish. This dinosaur birthday cake was for my niece’s kids birthday party with a luau theme, she wanted her two kids to each have their own cake to blow out candles on so that’s why I added the palm trees. When it was time to sing happy birthday I lit a sparkler and stuck that in the middle of the volcano and had the candles on the beach that spelled out happy birthday and other tropical fish candles.